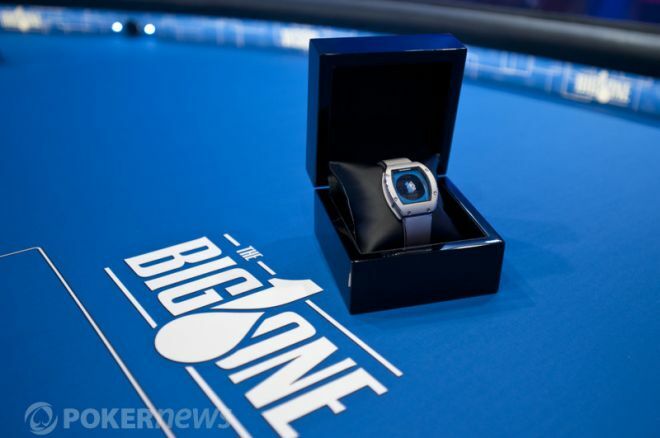 The biggest buy-in poker tournament in history played out this week as 48 players put up $1 million each to play in the Big One for One Drop, a tournament designed to raise money for Guy Laliberté’s One Drop Foundation. After three days of intense play, Antonio Esfandiari captured the largest prize in poker history, an astounding $18,346,673. Esfandiari's road to victory went through some stiff competition, and along the way there were more than a few game-changing hands. As the rest of the players we going on break, we happened upon a huge pot between Justin "Boosted J" Smith and Frederic Banjout. There was a little over a million in the pot with a board reading and Banjout had moved all-in for 2.163 million. From what Jonathan Duhamel told us, prior action saw Banjout check-raise the flop and then fire out big on the turn. Unfortunately that was all we were able to get amid all the excitement. As it were, Smith was sitting in contemplation and waited for the dealer to get an exact count. A few of the other players found their way back to watch the hand, and out of nowhere Smith said, "I call." Banjout then stood from his chair and slapped down for the nuts. Smith was devastated and tossed his cards to the muck, though tournament rules state the hand must be shown. Per the floor's instruction, the dealer turned over Smith's hand — . Smith thought he had been eliminated, but after the stacks were counted down, he was left with just 30,000. Smith would be eliminated shortly after returning from the break, making him the first Big One for One Drop elimination. While losing $1 million in a couple hours might be enough to ruin some men, Smith seemed in relatively good spirits when he tweeted, "Big surprise first elimination from One Drop very anti climatic unexpected ...oh well...hope there's another one of these soon." Just saw the craziest hand I've ever seen. Guy folded 88 face up on Js87s8sKs. Catching up with Eugene Katchalov on the break to grab a summary of the hand, he said Mikhail Smirnov did indeed fold quad eights to John Morgan. Katchalov told us that Tom Dwan had opened and received a call from Smirnov and Morgan before the fell. Dwan checked and Smirnov bet. Morgan called and Dwan folded. The turn was the and Smirnov bet 200,000. Overhearing a conversation from Smirnov, he said Morgan called within five seconds and looked extremely excited about the hand. The river completed the board with the and Smirnov bet 700,000. Morgan raised all-in for 3.4 million total and Smirnov tank-folded face up for all to see. Whether or not Morgan held the for the straight flush is unknown. The entire tournament floor has been silenced with the elimination of Jason Mercier. He and Antonio Esfandiari began the hand both over 10 million in chips and in the top five. At the end of the carnage, Mercier was left slinging his bag over his shoulder and quickly heading out the door. No one in the room had words for how big of a clash this really was. After the first group of players folded to Esfandiari, he raised on the button to 250,000. Mercier was in the small blind and put in a three-bet to 680,000. After Cary Katz got out of the way from the big blind, action fell back on Esfandiari. Esfandiari took some time to himself and then four-bet to a nice, big 1.6 million. Mercier didn't flinch, but instead studied intently. He then fired back with a bigger bullet, five-betting to 2.89 million as if to say, "Your move, Antonio." The man widely known as "The Magician" reached into his hat and pulled out 4.489 million rabbits for the six-bet. Mercier began the hand with a bit over 10 million in his stack and ripped it all into the middle. Esfandiari snap-called to create a ridiculously huge pot worth approximately 22 million in chips. Mercier was the player at risk, but Esfandiari would be extremely crushed if he were to lose this confrontation. Esfandiari tabled and Mercier turned over with a dejected look on his face. After the flop, the look on Mercier's face only fell more empty as Esfandiari stayed in front. Mercier was looking for a king, but the turn card was the and the room became dead silent waiting for the river. The only noise heard in the room was the slap of the final card off the deck — the — and Mercier extended his hand to Esfandiari before exiting to the rail. With that pot, Esfandiari moved to into the chip lead, overtaking his good friend Brian Rast. He's currently the only player over 20 million. It was a brutal spot for Mercier, and had he won that hand, he very well may have captured the top prize. Instead, the win helped propel Esfandiari into the history books. Brian Rast dominated the early stages of the Big One for One Drop, even finishing as the Day 1 chip leader. He managed to use his big stack to cruise to the final table, but it was there that his time would be cut short courtesy of a nasty river cards. Hand #51: Brian Rast had the button, and Sam Trickett opened to 1.2 million from under the gun. Rast called, and Antonio Esfandiari called from the big blind. The flop fell , Esfandiari checked, and Trickett fired 1.8 million. Rast called, Esfandiari folded, and the turn brought the . Trickett tanked, then led out for 3.8 million. Rast called. The completed the board, and Trickett tanked before moving all-in for effectively 8.275 million. Rast snapped it off, tabling for a flopped flush, but Trickett turned over for quad threes! In a stunning turn of events, Rast was eliminated in sixth place, earning $1,621,333. Trickett is now our chip leader with 51 million chips. It was another one of those hands that could have gone either way, but this one ended in Trickett’s favor, allowing him to make it to heads-up play where he finished as runner-up for a robust $10,112,001. There’s no doubt that Antonio Esfandiari ran extremely well during the Big One for One Drop, a fact that he certainly wouldn’t deny. This was evidenced in a hand against the founder of One Drop and the architect behind The Big One tournament, Guy Laliberté. Hand #60: Guy Laliberté had the button. Sam Trickett raised to 1.6 million from under the gun and Laliberté three-bet to five million. Antonio Esfandiari reraised from the big blind to 12.3 million and Trickett folded. Laliberté moved all-in for over 25 million quickly and Esfandiari called to put a pot over 50 million up for grabs. The flop came down and Laliberté stayed in front with his queens. The two stood hugging in the middle of the stage and looked to be having a blast, despite flipping for tons and tons of chips. The turn card was the and Laliberté fell behind as Esfandiari smashed a king to make a higher pair. The river was delivered with the and that was it. Esfandiari had won the pot and eliminated Laliberté in fifth place. Laliberté was sent off with a standing ovation from everyone in the room. Hundreds clapped and cheered before chants of, "Guy! Guy! Guy! Guy! Guy!" rang through the Amazon Room. He received hugs from all the players and gave them back, before exiting the same way he came in, through the back tunnel of the ESPN Main Stage. Laliberté winning the tournament would have been quite the storyline, but he was all smiles and gracious in defeat. Esfandiari also wore a smile, and with good reason — that hand helped him capture the largest prize in poker history. The aforementioned hands are just a few of the more memorable ones from the Big One for One Drop. To see a detailed account of how it all went down, be sure to visit our Live Blog where you can see all important hands from three days of intense action.